What a fantastic weekend of great weather, food and friends! I hope you all spent some quality time with someone special and soaked up some sunshine- I thought it was June it was so warm! 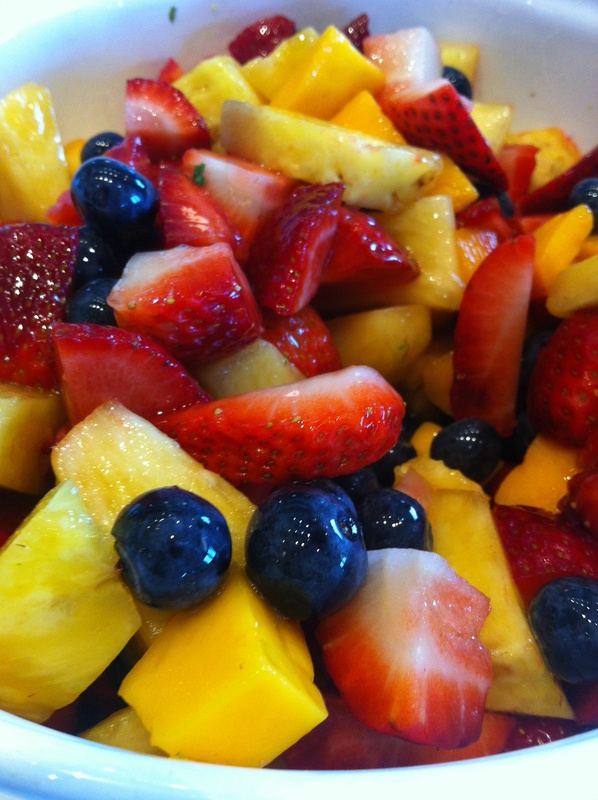 I was in the mood for a fresh and light fruit salad that would be the perfectly refreshing desert on a warm afternoon. Only problem was, I got all the way home from the store and realized I forgot the mint I needed to make my fruit salad! With no time to go back to the store, I decided to improvise with what I had. I love fresh herbs with fruit and I had a whole bunch of fresh basil on hand for another recipe. I couldn’t have asked for a more perfect substitution, the flavors were so amazing, this will definitely become my go to combination for fruit salad, Enjoy! You can substitute any fresh fruit you enjoy such as Kiwi’s, Raspberries, Blackberries, Guava, etc. Combine sugar and water in a small sauce pan and bring to a boil, stirring often until sugar is fully dissolved, about 1-2 minutes. Remove sauce pan from heat. Add lime zest and basil, stir and set aside to cool. Once the sugar mixture is completely cool, strain syrup through a mesh sieve into another bowl and discard solid pieces of basil and zest. 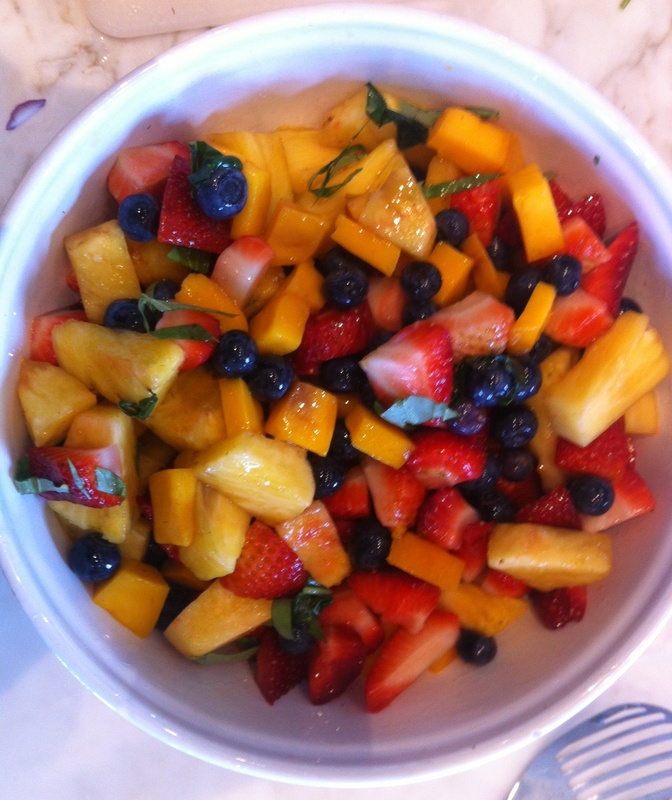 Combine all fresh chopped fruit in one large bowl and drizzle with basil-lime syrup. Mix to coat fruit completely. Refrigerate and serve. Garnish with a few pieces of freshly chopped basil. This entry was posted in Desserts, Recipes, Sides, Sweets and tagged basil lime, fruit salad by skibootsinthekitchen. Bookmark the permalink.